I am apologizing in advance. There are a few steps I failed to take pictures of. Apparently I got too busy and missed documenting a few steps. I started with a 6' long piece of 8 x 8 timber. 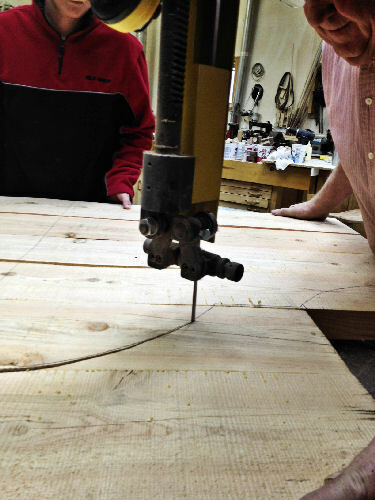 With the assistance of my father we cut the timber down into four 2" boards using the bandsaw. We then glued and clamped these boards together. Don't mind the dark stain on one. One side of the timber had been stained for the exterior of our house before I was informed that it wouldn't be needed. 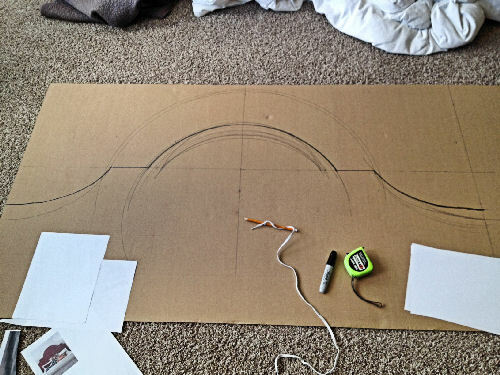 While waiting for the glue to dry I drew out the shape I wanted for the headboard. You can see from the various lines that it took me a few tries before I got it right. 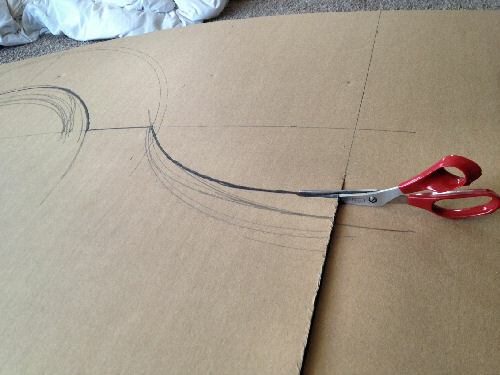 Once I had my shape ready I cut it out. And then propped it against the wall to make sure it was going to work like I wanted. 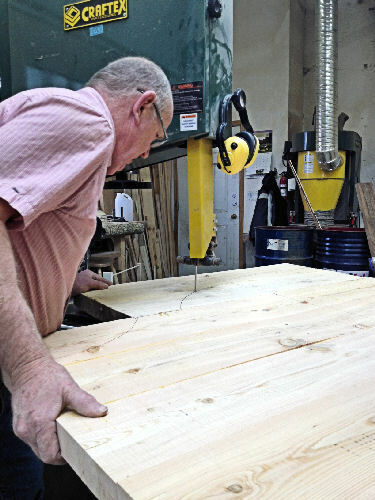 Once back out in my Dad's shop, we traced my cardboard pattern onto the timbers and cut it out using the bandsaw. I really can't take much credit for this step. He did most of the work. I simply helped support the headboard. This is where there is a large gap in the photos. Next step: sanding, sanding, and more sanding. I only sanded mine to 60 grit as I wanted a rustic look to remain. Then I stained it with early american stain by minwax and finished it with three coats of glossy varathane. Once inside we screwed the headboard into the wall. Time to build the base. 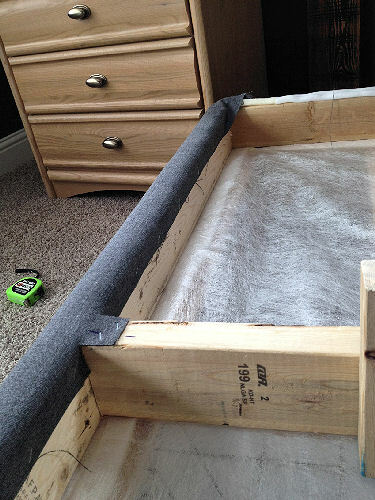 There are a many upholstered box spring tutorials floating around on pinterest. 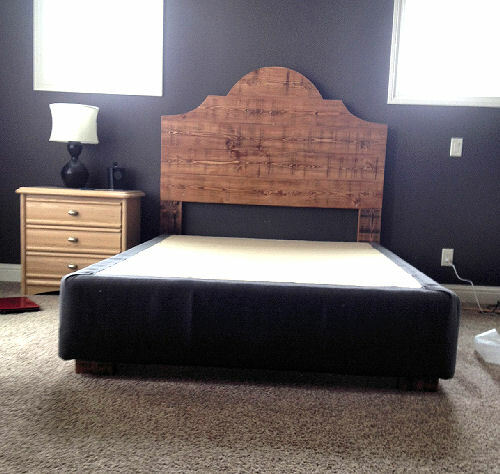 They intrigued me but posing this idea to my father and husband they both agreed that there is no way that the box spring is designed to support the mattress with the addition of a few feet. 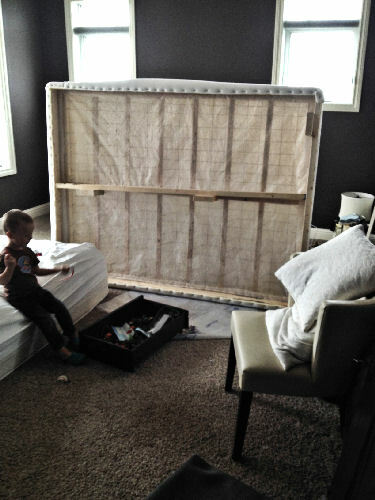 Therefore we had to create a frame for the box spring. 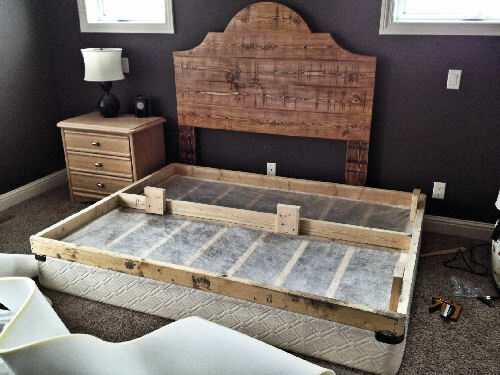 You can see our 2x4 legs in this photo placed at what will be the head of the bed but inset. 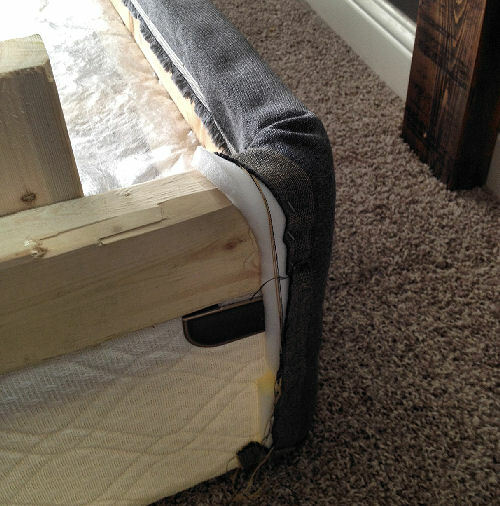 The legs coming down from the headboard are the 'faux' legs that will look like the base is using for support. And two additional legs running down the center support piece. 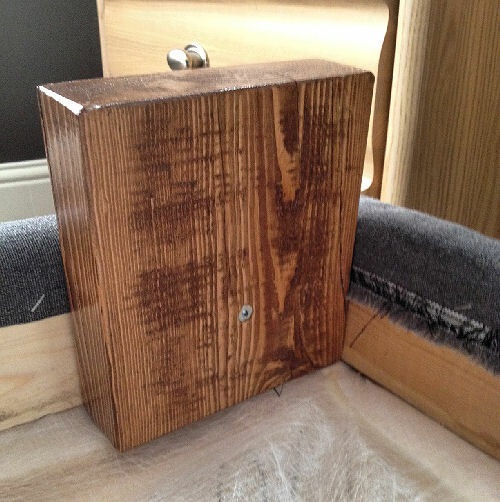 You can also see in the below photo how we clipped the corners to match the curve of the box spring. 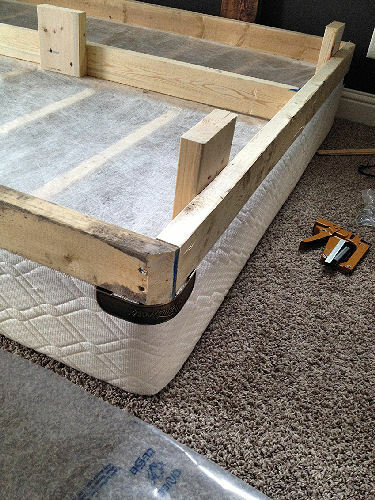 Now its time to upholster both the 2x4 frame and box spring to create the base for your mattress. I used 1/2" foam. 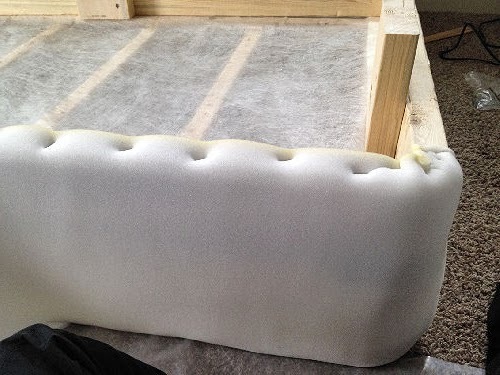 The foam was wrapped around the box spring and frame and stapled to the underside of the frame. Here is another lack of pictures. 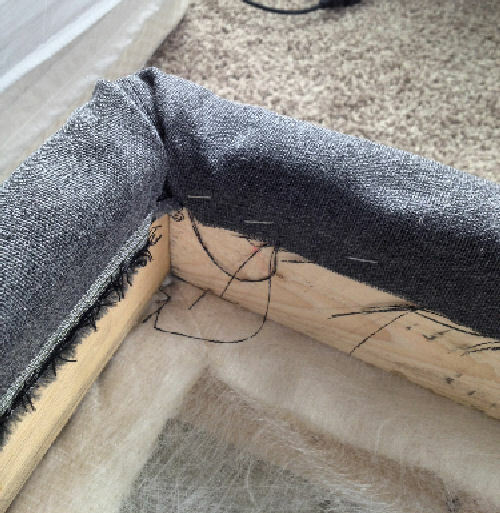 The top of our box spring has no wood but rather a metal cage-like structure so I simply wrapped the foam over the top by about 4 inches and hot glued it into place. Adding the fabric. The fabric I selected is a dark grey heavy canvas type fabric (mixed fibers). I wrapped it over the edge of the frame and stapled to the underside. Folded the corners in and stapled away. This is the top of the bed which will sit against the headboard. I chose not to wrap the fabric across the whole top as it is not visible. And again wrapped the fabric over the top of the box spring and hot glued. I then screwed the legs that I made from the timber into the front of the frame. And positioned the base into place against the headboard. Complete! Now go dress your bed! I'm extremely sorry for the lack of photos. I thought I had done a better job at documenting each step. I cannot stress how simple it was to build. If you have any questions or need more details please email me and I will try to assist you. It is so gorgeous!! 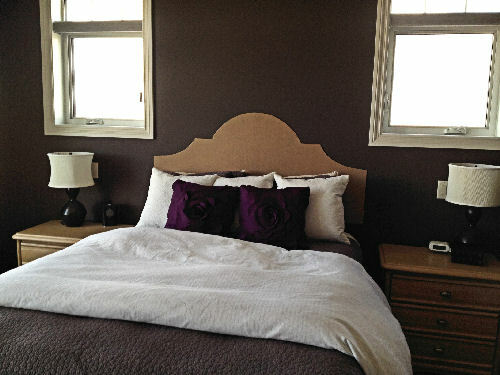 Can you tell us the fabric that you used for the duvet and box spring if you know, or maybe where you go it? Is your bed a queen? That is gorgeous!!! So impressed with this awesome DIY! Thanks so much for sharing. I am feeling very inspired to get our Master bedroom up to par. Wow, that is amazing! What a great DIY! 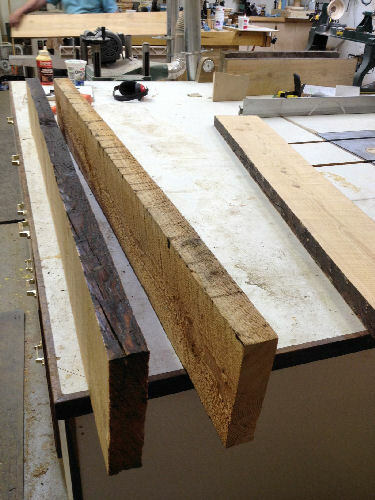 The premier method of connecting the timbers is with Wood Pegged Joinery. You've seen barns, hundreds of years old, with no roof and still standing. 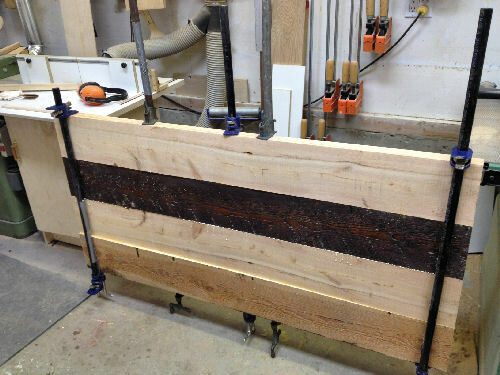 Other methods of connection are not as mysterious, such as spiking, screwing or bolting the timbers together between metal plates. Awesome job. 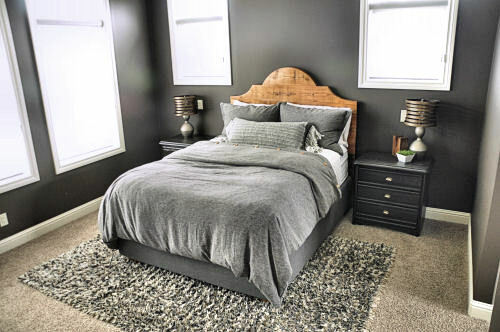 Your bedroom looks great. Wouldn't it have been better to wrap furniture before the legs were put in?